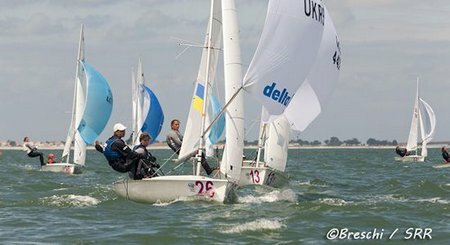 Scattered showers, intermittent sun and a fluctuating breeze over today’s 3 races gave a real flavour of racing on the Atlantic coast off La Rochelle, France on day 2 of the 470 Junior Worlds, 470 Masters’ Cup and 470 Open Classic events. 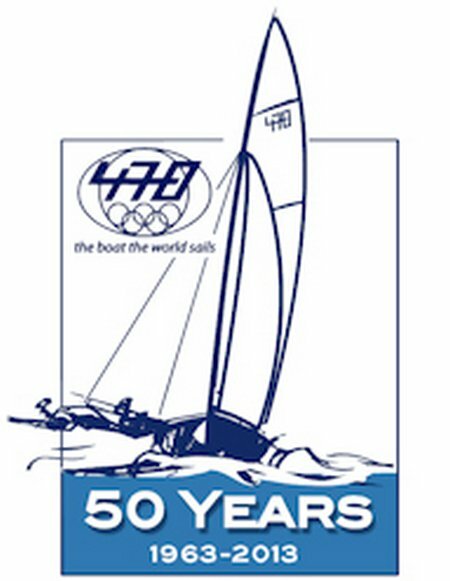 179 teams are competing in these three events, which yesterday opened the 50th Anniversary Celebrations of the International 470 Class. The forecast 12-13 knot breeze did not materialize, so with the variable 7-9 knots the Oscar flag, which informs teams whether or not they can pump, went up and down. A strong current saw the Race Committee re-set start lines and change courses for the variable breeze, whilst for the teams on the race track the light breeze and irregular sea conditions really bounced the boats around. An all French top three after the five race qualification series ended today. The 59 boat fleet will now advance to the final series, with 30 boats in the gold fleet and 29 in silver. Luckily for Pierre Quiroga/Clement Pequin (FRA) the discard kicked in today after race 4, so their setback 22nd place in race 3 is now out of their scoreline. Teams will carry points equivalent to their position on the leaderboard into final series, which will see 7 races scheduled to determine the top 8 boats advancing to the medal race on Saturday 3 August. Quiroga/Pequin were in La Rochelle training all last week and learning some of the peculiarities of the venue, “Last week we learnt to monitor water level and signs that allow us to gain speed around the track,” said Pequin. Guillaume Pirouelle/Valentin Sipan (FRA) sit just 2 points behind in second on the leaderboard, with Hugo Feydit/Charlie Ageneau (FRA) in third. On equal points with the third placed team are South Africa’s Asenathi Jim/Sibu Sizatu, who have accelerated to fourth on the leaderboard, counting a 1,2 from today’s races, and discarding a 10th in race 3. One of the younger teams competing here are brothers Alex and George Kavvas from Greece. 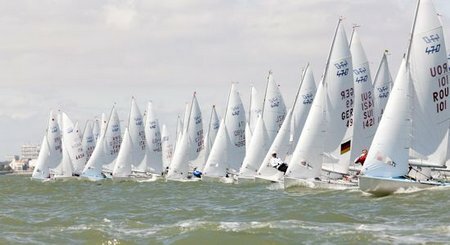 Last year the 420 World Championship title was in their hands, so far in La Rochelle they are safely inside the top 10 at their second 470 Junior Worlds appearance. Racing continues on Wednesday 31 July with two races scheduled. France’s Maelenn Lemaitre/Aloise Retornaz put in three more solid race results today, with a 4,2,2 to give themselves a helpful 9 point margin with 5 races now completed. The twenty-five teams competing in the women’s event are sailing a single series and discard kicked in after race 5, so some shuffling on the leader board puts some new faces in the top 10. Pushing on up to second are the Ukraine’s Anna Kyselova/Anastaysia Krasko who won races 4 and 5 to move up into second overall. 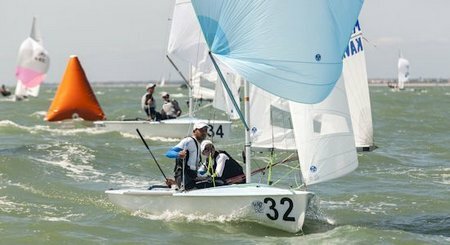 The pair finished third at the 470 Spring Cup in April this year, and their best result at a Junior Worlds was back in 2010 in Doha, Qatar when they finished in 6th. A handy gap after the first race as the Race Committee re-set the start line to adjust for the current, gave the pair time to review their performance as Kyselova explained, “We analysed our problems and understood the race and so for the next two races it was different. We started and had good speed, so moved ahead of the fleet and then just kept close but were in the lead.” Two first places ranks as the team’s best ever performance in a day’s racing! They are in La Rochelle for the entire 50th Anniversary Celebrations, so relief to find they are enjoying the experience so far, “It is great here and there are so many people. It is very relaxed and it is a really friendly atmosphere, we are enjoying it,” concluded Kyselova. Moving up to third overall are Australia’s sisters Sasha and Jamie Ryan who are world ranked #15. 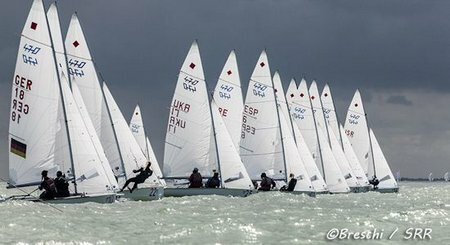 Many new faces have made the transition to the 470 junior fleet, including the 2012 420 Junior European Champions Annabel Vose/Kirstie Urwin. 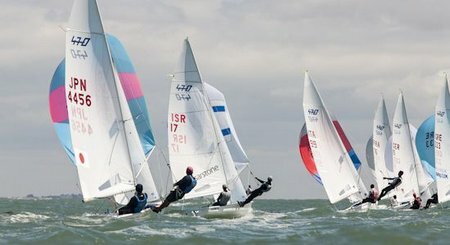 Before the 470 Junior Europeans, they also sealed silver at the 2012 ISAF Youth Worlds and made the transition to the 470 soon after. Rock back a year earlier to 2011 and Vose, with then crew Megan Brickwood, won the 2011 420 Ladies Worlds in Argentina. Many of the teams have been racing each other for years and along with Vose in Argentina was Germany’s Nadine Bohm, who claimed the 420 Worlds silver medal. Bohm is sailing with Karoline Gottzer in La Rochelle and so far has the leader board advantage in 11th overall, with Vose in 15th. The bronze medal in 2011 went to the current series leaders Lemaitre/Retornaz. Iulia Fulicea/Paul Negoescu (ROU) continue to dominate in the Apprentice Masters with an orderly 1,2,3 scoreline today. Fernando Zicarelli/Davide Gamba (ITA) hold their place at the front of the Masters’ fleet, whilst Francois Brenac/Jacques Dirussso (FRA) knock Bernard Boime/Gilles Espinasse (FRA) down into second in the Grandmasters. No change in the Grand-Grandmasters line-up with Robert Maurel/Gerard Daugey (FRA) continuing to dominate. In the Open Classic Annette Forster/Tobais Forster (GER) also hold onto their first overall. The Masters’ Cup and Open Classic fleets will enjoy a lay day tomorrow, so time to explore the joys of La Rochelle. Over the next two weeks, from 29 July to 10 August, there will be back to back racing in La Rochelle to celebrate the past, current and future generations of 470 sailors and sailing. Organized in collaboration between the International 470 Class Association, Société des Régates Rochelaises, AS470 France and the Federation Francaise de Voile, alongside the racing there are numerous shoreside activities, including a concourse d’elegance of some of the earliest built 470s, the launch of the 470 Great Book, Legends’ Trophy, 50 Year Cup, Gala Dinner and much more – wrapping up on 10 August with the Closing Ceremony for the 2013 470 World Championships.